Finally! 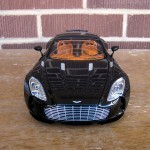 Ladies and gentlemen, the AUTOart Aston Martin One-77 is here, and here’s why you should be excited. For starters, just look at it. I don’t think there’s a single thing wrong with the design. It’s a fine statement of muscular elegance, and frankly it looks good in any colour. As the name betrays, they only made 77 of them, which surprisingly took a year to sell. Each one was handmade to outlandish standards. The aluminum front wings, for example, each took one man three weeks to build. 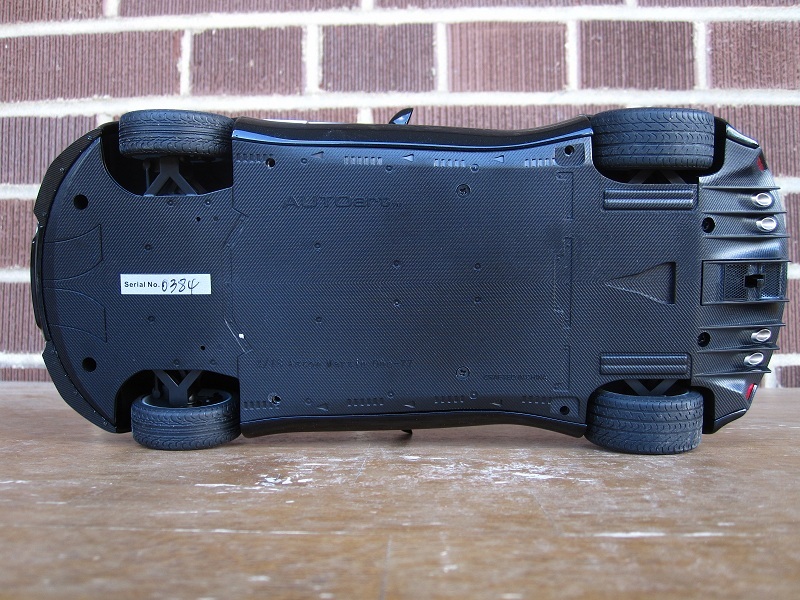 That fancy inboard suspension isn’t only there for looks. It’s fully accessible so that the owners can customize the setup to their liking. 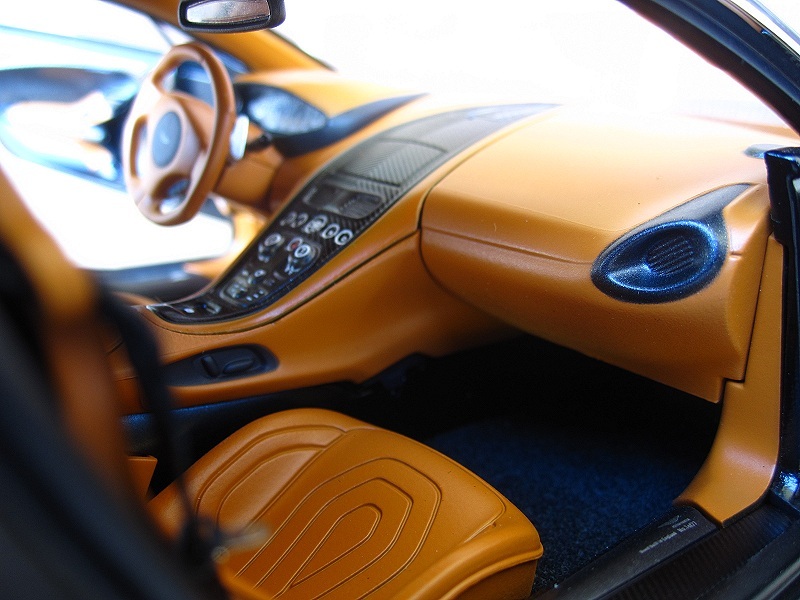 The interior schemes were completely bespoke – the owner could choose or design their own colours, patterns, shapes. The choices of switchgear materials included gold, dark chrome, and something called “ruthenium”. Clearly, AUTOart’s replica has a lot to live up to. So let’s see how they did. As soon as you lift the styrofoam shell off the car, you are hit with the awesome paint. AUTOart almost never disappoints in this regard, and here they’ve really outdone themselves. 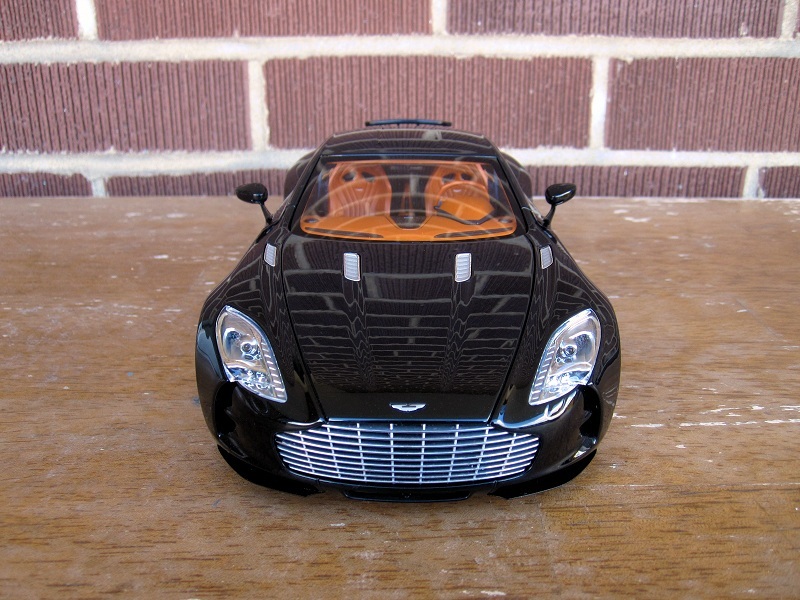 The metallic flakes are beautiful and give the One-77 the depth it deserves. There are 3D Aston logos front and back, and the lights look extremely well done. There are also subtle carbon front lip and rear diffuser. The chromed window trim and side strakes look great and are well aligned. 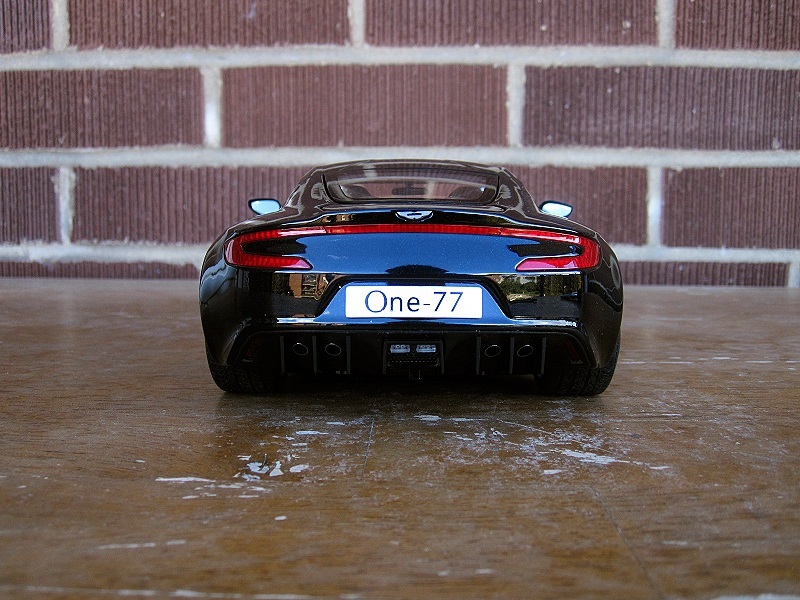 A laughably tiny spoiler pops up from where the boot lid should have been, and is arguably the only weak point of the One-77’s design brief. Luckily, it is retractable and shouldn’t spoil the show too much. Pressing it back down into its cavern yields quite a lot of resistance and really makes you feel as if you’re about to hear an expensive crack. Just when you think you’re about to collapse the rear suspension, it clicks into place and all is well again. 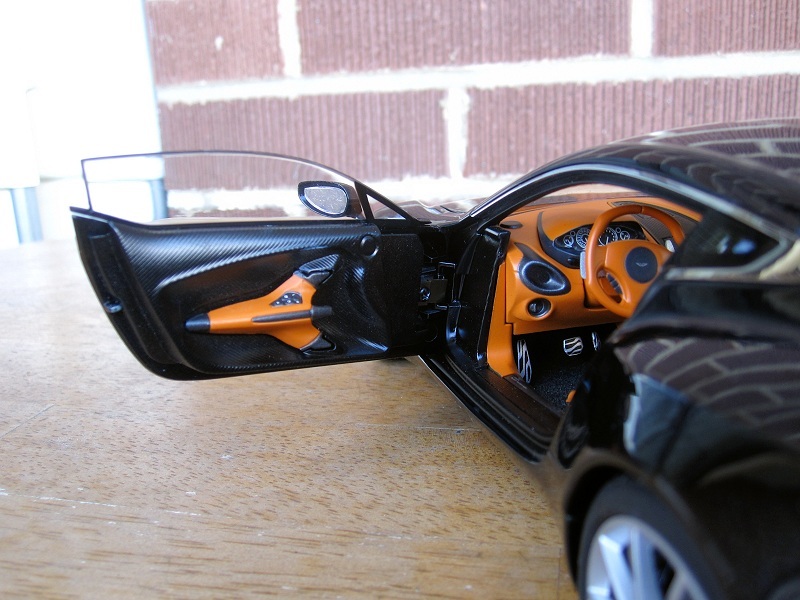 The side mirrors are molded into the body and look very sharp, too. Popping open the rear glass compartment, which is suspended on metallic struts, one finds the partially exposed rear suspension. This is where AUTOart’s first mistake lies. After examining reference pictures of the real thing, it seems that the two holes are covered with either glass or clear plastic, and in the model they are not. Lifting up the perforated hood, we find the 7.3L V12 engine nestling in its place, not providing much eye candy unfortunately. The suspension bits come to the rescue once more and lend the engine bay some life. 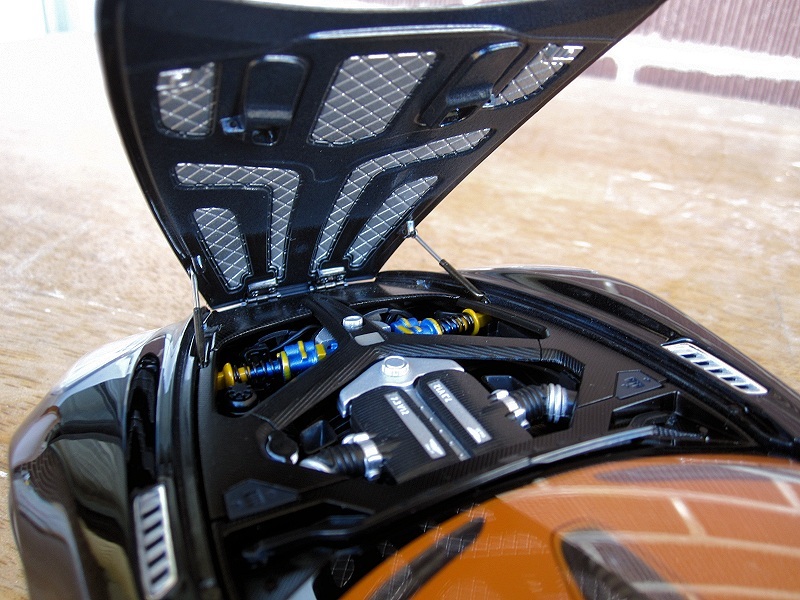 Shine a bright light into the engine bay and you’ll be able to see a tad more detail, but not much more. The engine bay on the real thing seems to have a tad more color coding going on. 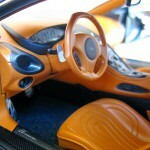 The interior is a real treat, as we now have four different choices when it comes to colour. In fact, I can’t remember AUTOart ever offering a model with four distinctly different colour combinations. Colours are all smooth and there is carbon behind the seats. The doors look great and are suspended by elaborate looking hinges. The only disappointing features are the one-dimensional gauges and a toy-like steering wheel. The tires are okay, but the rims look a little on the cheap side. I think AUTOart has to put a little more effort into their wheels. They’ve done great work here before, so I know what they’re capable of. The brakes emulate carbon-ceramic material well and are hugged by calipers that have the Aston logo and “One-77” printed on them. Turning the car over, we find a largely featureless under-body, as on the real thing, with suspension that sadly does not function. 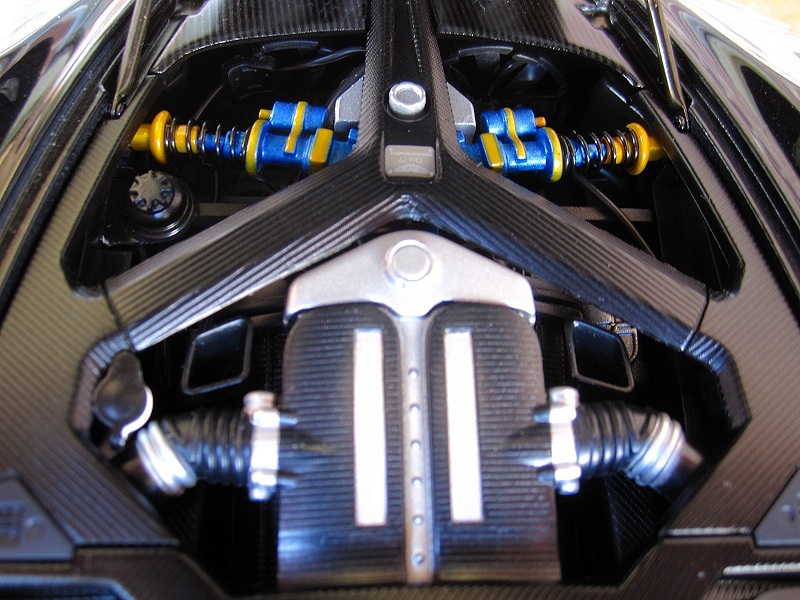 I guess the explanation is that it wouldn’t be cost-effective for AUTOart to reproduce the intricate suspension workings of the One-77. Apart from that, there’s a bit of mesh, a button to deploy the tiny spoiler, and awesome looking exhausts that sit flush with the carbon diffuser. So what we have here is an excellent effort by AUTOart, which is not without its flaws. Is it worth $200? Yes, but only just. This thing is more than the sum of its parts, and should be judged as such. Add one to your collection, whatever the colour. It’s a great model of a gorgeous British automotive icon. 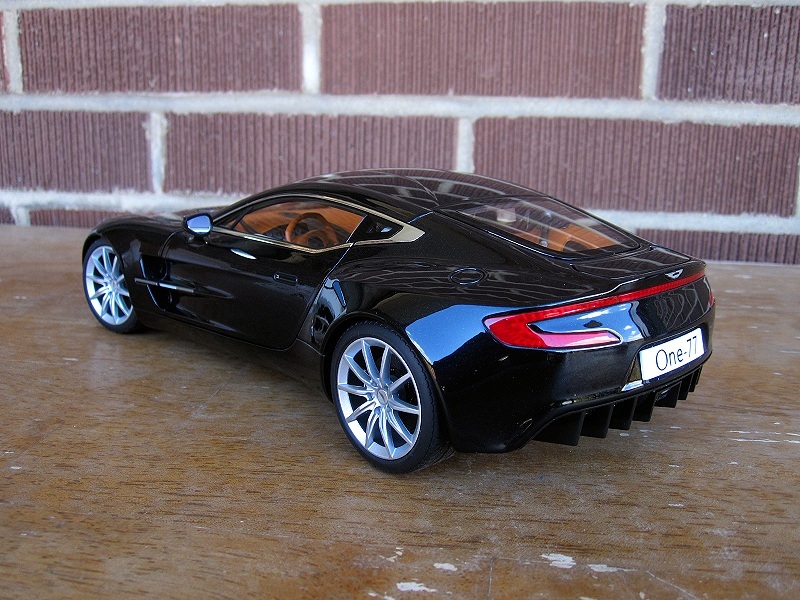 7 Responses to "REVIEW: AUTOart Aston Martin One-77"
My pleasure. Definitely get one. Nice review. 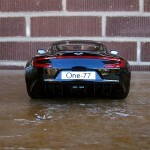 The One-77 has been on my list of possible purchases, so it was nice to read about it’s pro’s and con’s. Thanks! I’m looking forward for some more reviews. AutoArt has a lot of good cars coming out for the remainder of this year! And we’ll review them all! Great review! This model is definitely on my wish list. I’d definitely get it in the same color combo as yours. 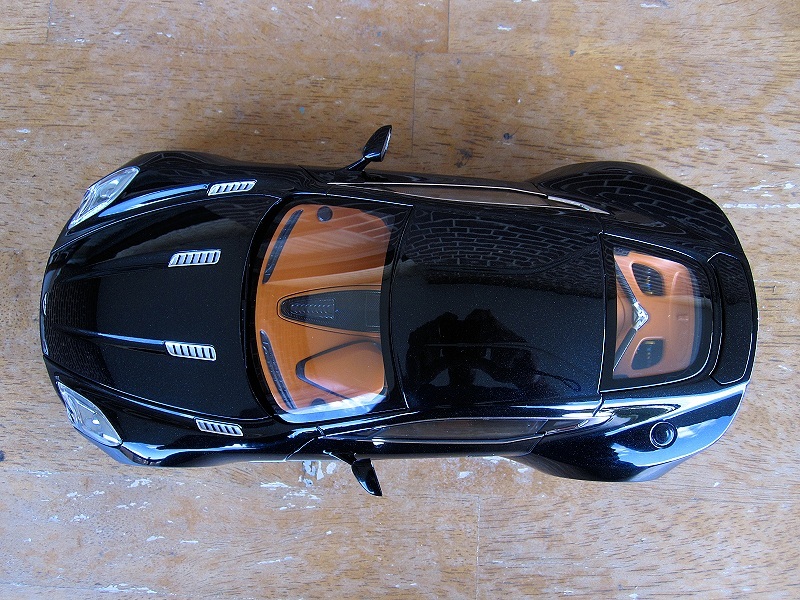 But before i get a one-77, i HAVE to have the Veneno that’s suppose to come out during Q4. Good review. Not great. But honest. I agree totally. What do you want for 200 plus dollars? 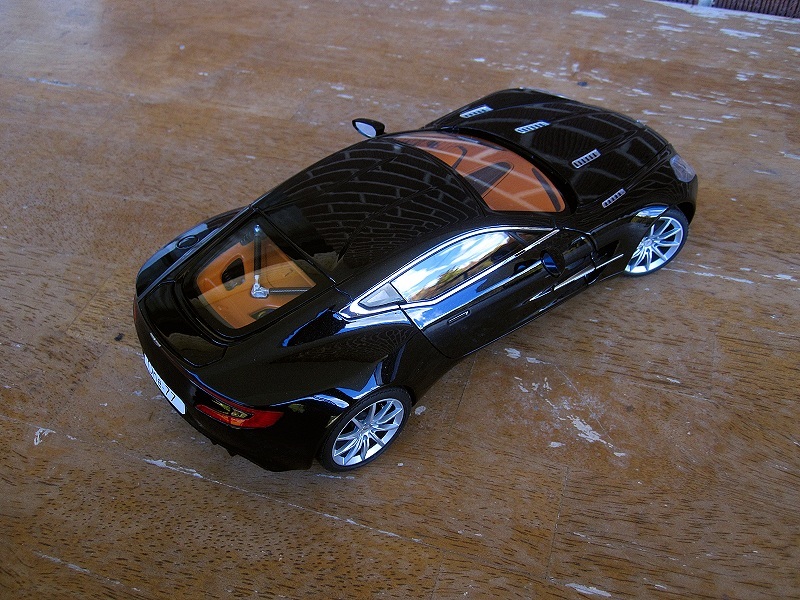 I had the luxury of seeing the first One-77 ready for delivery. In Gaydon. 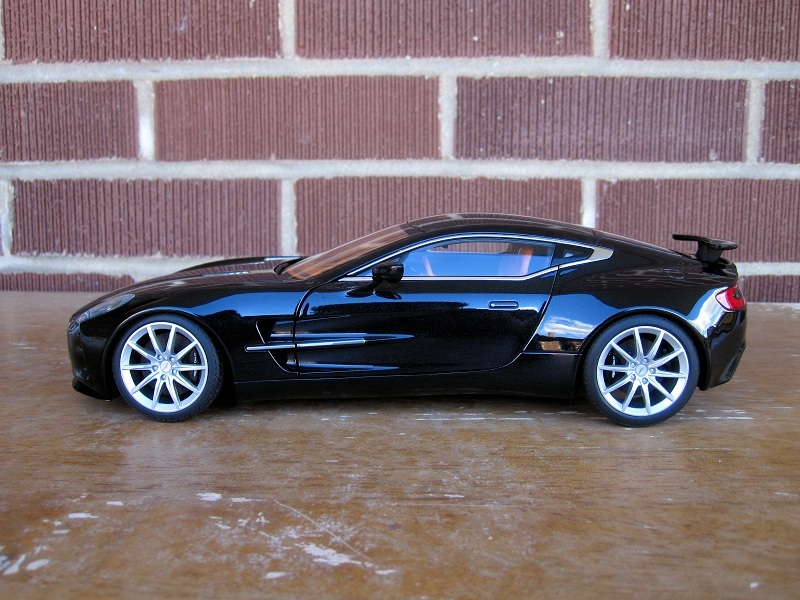 But the model does LOOK GREAT sitting in my collection of Astons. Great review and you pointed out the flaws here and there. One other minor flaw is that the three mirrors (the rear-view mirror and the two wing mirrors) have silver paint applied rather than three small pieces of real mirrors put in place. My personal point of view is that it may not be cost-efficient for Auto Art to cut really small pieces of mirrors for a model in this scale (1:18). Very tempting to get one.